After the success of the 2015 O75 tournament, there were great expectations for this year. I anticipated teams queuing to enter and bribing me to let them in. What a disappointment! The number of let-downs and lack of replies was quite depressing but, thanks to the efforts of Rob Oakley, Adrian Stephenson, Roger Girling and Nigel Spencer-Knott the required number of teams eventually turned up (even though some had to borrow players to make up numbers). 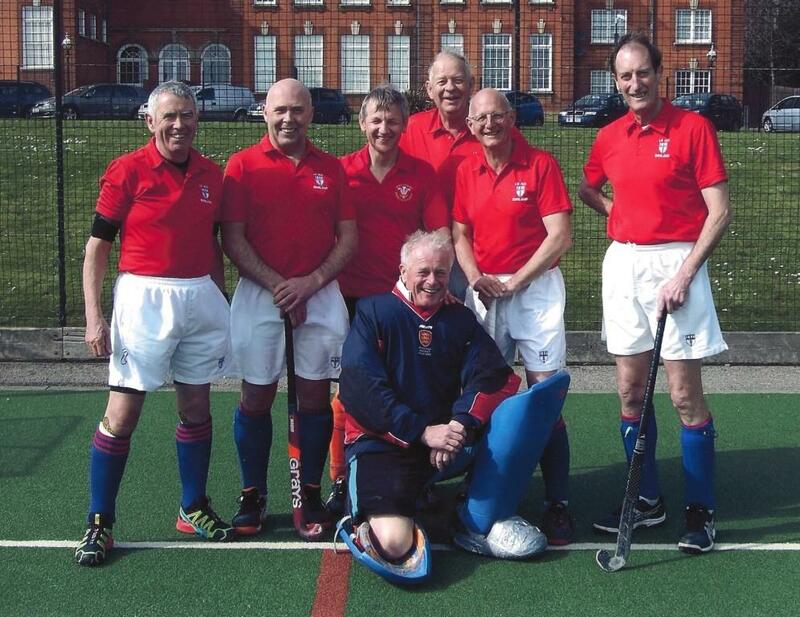 The full line-up became South, West, Midlands, East (with help from Alliance) and Kettering Ladies (in place of North) in the Regional championship and Wales O 70s, Ousels, St. Albans, LX, and Kettering ex-vets in the Aspirants event. The weather was perfect; the atmosphere delightful and the hockey competitive – in spite of some of the scores. The old men were outplayed by Kettering ladies, assisted rather too well by some of their offspring as young as 10 and 11 (actually, a delight to see), but the trophy was retained by the South team. Well done, Mike and co! The Aspirants produced some excellent performances, especially by the Kettering ex-vets. I declare a bias here because only 1 of the Saturday Kettvets (and their borrowed keepers) has played hockey in the last 8 to 10 years. As you all know, the game has changed enormously in that time, so they were on a hiding to nothing from the start. Nevertheless, there was some excellent hockey to match the weather and, as far as I could see, everyone enjoyed the weekend. I want to commend the support from Kettering Hockey Club, to the members who kept the players supplied with refreshments, to all the umpires, especially to Mark Stevens, Roy Woolley, Andy Watson and Chris Hales who gave up their weekend to help, to the physios and their supervisors and, of course, to all the players who came to enjoy the event. The queues will be forming as soon as next year’s dates are known and KHC looks forward to welcoming you all. It was a very enjoyable two days with games played in a competitive but sporting manner. I think that special mention should be made for Kettering Veterans who, despite severe tests on Saturday, never stopped trying and played with smiles on their faces. Secondly, to Liz and her student physios who performed wonders on Sunday to keep tired and aching limbs functioning – to the extent that Nigel Strofton declared himself a new man after his session. Not sure what Mrs. Strofton had to say on the subject!